Judi Curtin, the well-known children’s author officially opened our school library a number of years ago. Pupils from Senior Infants to 6th Class borrow books each week. The Board of Management and our Parents’ Association fund the purchase of books. A large number of books were donated by pupils, parents and individuals and we also ran a ‘Buy a Book Day’. Our annual Book Fair raises money to update the library. The school is very proud of the wide range of books now available to the pupils. A large number of fiction books are available, including works by Judi Curtin, Adam Blade, Michael Murpurgo, Anthony Horowitz and many, many more. Fact and reference books are also stocked, including books on sport, nature, cookery, history and geography. The infants are also well catered for with a large collection of picture books. 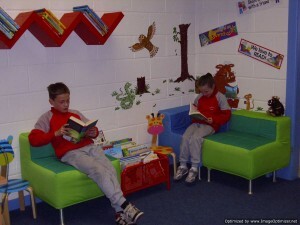 Comfortable seating makes this a really warm and inviting space for pupils to ‘get lost in a book’. What books would you like added to our library? Don’t forget to add your suggestions to the list in the library.